Here are is my series of alarms that ambush me every morning, and as you can see I have cleverly labeled the 6 am one as if that is an effective incentive to get out of bed. This year I have recorded 6 tardies. Last year tardies were not such a big deal as I recorded just short of 50 tardies and received nothing more than a scolding. However, this year T. Block and his crew are cracking down on late wakers. If I told you I was a morning person it would be a blatant lie. 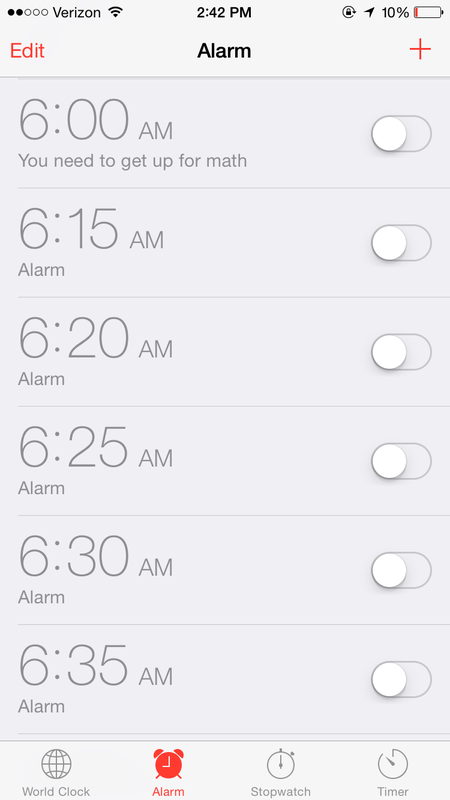 I struggle with waking up early in the mornings however I think it is pretty understandable. When weighing options, the coziness of my bed always seems to top the thought of making my way to the freeing cold hell we call Mariemont High School. However my tardiness is something that must change as I am one tardy from a Friday school. So I think it’s time I analyze and reflect upon the flaws in my morning routine, First off, I rely upon not an actual alarm clock but my iPhone as my waker. I usually set about 5 to 6 alarms in the theory that the I will eventually get so annoyed I will get up however every alarm is equally ineffective as I snooze all of them and don’t actually get up until 7:10. My only other form of alarm clock is my mother who is also not a morning person. She typically persistently calls me which is really quite silly considering I hang up on all of her calls. In a last ditch attempt she will walk sleepily to my doorway and tell me about the punishment I will receive if I am tardy again. This morning while half asleep she exclaimed “Get up or your going to have another suspension!” which was a surprisingly effective tactic because I was equally as out of it and bolted into the shower before I had realized that she had confused suspension with detention. The good news is that tardies reset with the coming of the new quarter and the 2nd quarter can’t come fast enough.